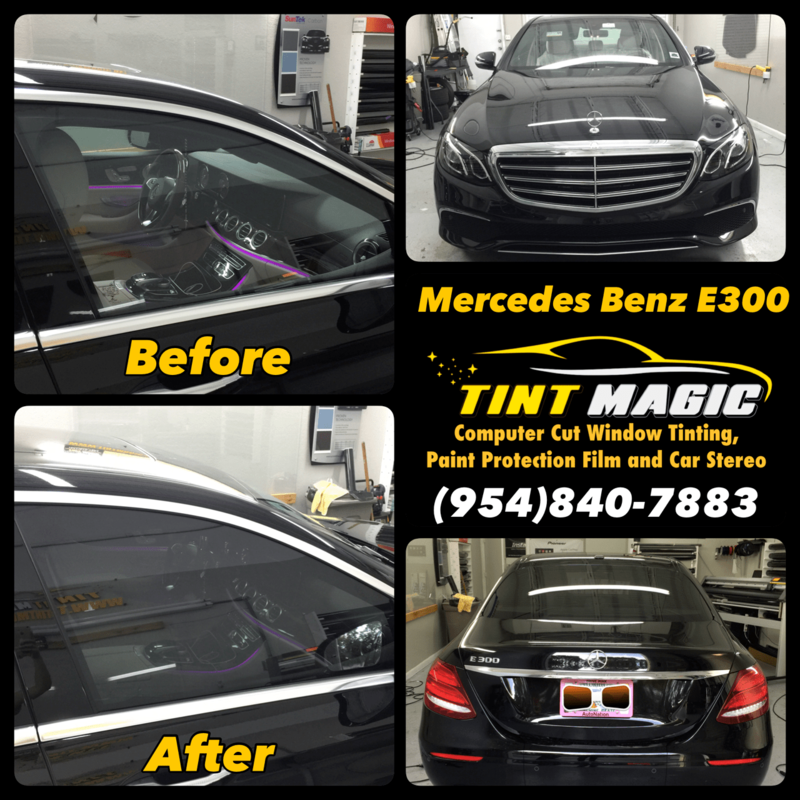 Mercedes Benz E300 at Tint Magic Window Tint Coral Springs, we applied SunTek CXP 25% all over around for the best heat rejection and UV protection. Call us for the best quality and service! (954) 840-7883. Many of today’s mid-size luxury sedans fetishize sportiness, but there are still hordes of customers in this space for whom sports-car-challenging Nürburgring lap times, quick steering, and firm suspension tuning matters little. While the E-class’s (optional) ability to drive itself for up to 60 seconds at a time would seem to fit that definition, so, too, does the car’s comportment when your hands are on the wheel and your feet work the pedals. Everything about the primary controls feels numbed to minimize driver effort or fuss. In any drive mode—a range that includes Comfort, Eco, Sport, Sport+, and Individual settings—the steering wheel spins with a positive, albeit liquid, damped movement. As cornering forces build, so does the steering’s sense of weightiness, but the delta in effort isn’t huge and there’s no pesky road feel to jiggle your fingers. The sportier drive modes raise the baseline steering heft somewhat, but the E never requires that the driver throw a shoulder into it. Similarly, the brake pedal moves through a squishy, pudding-like resistance after an initial zone of free play yet responds to the first tap of pressure. Mercedes-Benz offers three suspension setups for the E300, a pair of traditional steel-sprung configurations with continuously adaptive (but not driver-adjustable) electronic dampers and a $1900 air suspension choice, all of which can be described as comfort-oriented. For the E300 Sport, the adaptive dampers are slightly firmer, while the no-cost E300 Luxury trim is tuned more softly. (The Sport and the Luxury are otherwise pretty much the same, although with different grille designs.) The E’s brain works with the dampers to continuously adapt to changing conditions, firming things up in corners and relaxing them when driving in a straight line. For the most part the ride is compliant and composed. Over pockmarked pavement, however, the electronics weren’t quick enough to stiffen rebound damping (the resistance to allowing the suspension to decompress, say, as the car crests a hill) or to settle the suspension after larger dips in the road, leading to some secondary bobbing.